Climate change? There are emojis for that. 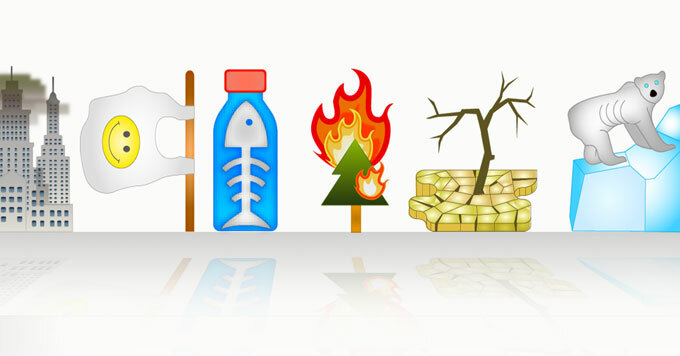 The icon set includes wildfires, power plants, and melting glaciers. Emojis have become a regular part of today’s online conversations. Those little pictures have evolved far beyond smiley faces. There are now hundreds of icons to liven up a message, from rainbows and hearts, to tiny koala bears and margaritas. And now, you can download a new set of digital icons called “Climoji”. It includes cartoon depictions of the causes and effects of climate change, including power plants, wildfires, and melting glaciers. Texting or tweeting one of these images might seem trivial. But Marina Zurkow, the artist and New York University professor who leads the Climoji project, says that it’s important to find new ways to communicate about climate change. For some people, the light-hearted, visual vocabulary of Climoji makes it easier to talk about climate change. Climoji image graphic: Created by David McCarthy.